IRS Form 1099-int, "Interest Income" is a tax form issued by the United States Internal Revenue Service. The latest version of the form was released in January 1, 2018. A up-to-date fillable 1099-int Form in PDF is available for download below. The IRS-issued "Interest Income" is available for digital filing or can be filled out through the Adobe Reader application on your desktop or mobile device. instructions, as well as any publications you may order. Information Returns (AIR) program (visit www.IRS.gov/AIR). or foreign postal code, and telephone no. income tax return as tax withheld. amount is included in box 1.
required to report the gross amount of interest paid to you. or a credit on your Form 1040. See your Form 1040 instructions. Box 7. Shows the country or U.S. possession to which the foreign tax was paid. the issuer has reported your complete TIN to the IRS. for a tax-exempt covered security acquired at a premium. instructions above for a tax-exempt covered security acquired at a premium. assigned to distinguish your account. Box 1. Shows taxable interest paid to you during the calendar year by the payer. above for a taxable covered security acquired at a premium. 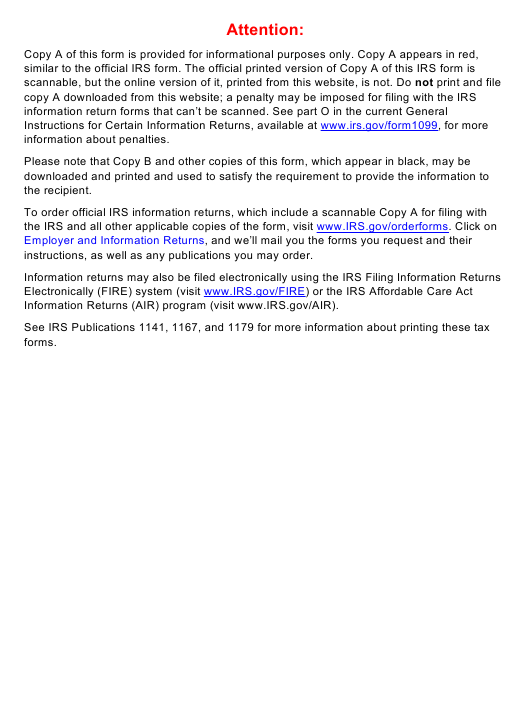 your income tax return as directed in the instructions for Form 1040 or 1040A. IRS Form 1099-R 2018 Distributions From Pensions, Annuities, Retirement or Profit-Sharing Plans, Iras, Insurance Contracts, Etc.